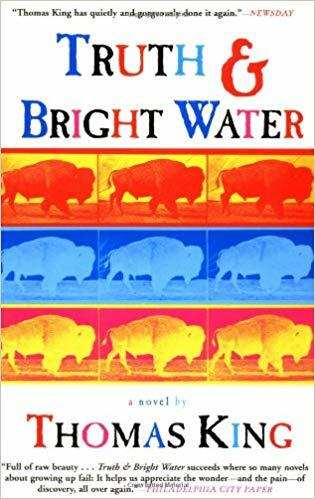 The heritage of Truth and Bright Water, or more specifically the reason why it has ultimately fallen into my hands, when I am myself not particularly a great reader of the literature associated with the Native Americans, the indigenous people of my own continent, is one which I cannot really resist sharing. It happened sometime in the spring of 2017, wandering through the streets of Strasbourg, after a voyage there from Metz, during which time period I had happened upon a young woman who was studying English - well to be fair, she already spoke it essentially at a fluent native level, better than my French at the time, although I think now, other than my continuing difficulties with my accent, I would be probably able to equal her skills. In the midst of our conversation as she had shown me the way to my destination, she had mentioned a book which had been assigned in one of her classes, a literature book, one which had been to her, a sparkling jewel, stunning, amazing, and brilliant. Its name? Truth and Bright Waters. Being a man who is either prone to fast whims and decisive strokes, or conversely, extreme lethargy and waiting, it the year of 2017 filed past behind me, and so did much of 2018, before I found myself returned to France, at which point, in the midst of purchasing a wide variety of books, I thought upon the idea of perhaps purchasing Truth and Bright Waters, to fulfill the recommendation of distant yesteryear. And thus I did, and read the book quickly, perhaps in only a day or two, as again, in tune with my style - that a book might flash by in a single day or at most two divided by the fallen sun, while at the same time others, although of much greater length (As Le Don paisible, falling to that Russian habit of producing books larger in size than their vast country, can attest, marked as it is by its own titanic length of some 1,400 pages in its French translation) can stretch over the course of weeks or even months. And then, upon completing it, for months afterwards I did nothing. I allowed the thoughts to mill over in my mind, subconsciously for the most part, but I am certain that they did their own battle, free from the cloying supervision of the active part of the brain which enforces its dictatorship over the thoughts of the rest. A decision should either be taken quickly, or meditated upon at length, and in this case, the latter presented it to myself as the only palatable option. For I am, I must say, still deeply puzzled by this book, one which I consider to be a most strange and odd one, quite different than most novels which I have previously read - and certainly I have read enough, with my room's walls covered with hundreds upon hundreds of them in their serried ranks, the bases bulging with tomes like the scree beneath a mountain. Certainly I must credit to the book its occasional flashes of brilliance and its spirit, in its characterization, presented as we are with its flawed, human, spirits, in the form of Tecumseh, the uncertain, perhaps not shy but not fully adult, teenager who attires our interest and attention by his quiet unassuming but nevertheless very real, if uncertain also one who stands poised for the future, or Lem, the troubled and anguished young man who hides his problems beneath the surface, who runs away from, the exotic and bizarre artist Monroe, with his perhaps quixotic but fascinating interest in Indian heritage, culture, and society, expressed both in his own personal projets and his pieces of art, Elvin, Tecumseh's father, with his sense of, perhaps irreverence, his nonchalance, his casual way of approaching affairs, his spirit with its energetic marshaling of words and significations, reversible with such fluidity and ease, even the dog Soldier, and of course, many others throughout the novels. So too, the stage on which their action takes place is one which presents its own intrigue and its own interest. Life on the frontier between Canada and the United States, among the Indians of this land, is vividly displayed, from both its quiet normalcy to the buzzing excitement during the Indian Days, with a sense of quiet, perhaps poverty, perhaps simply the lack of material wealth associated with rural country life in this distant place, separated from the great cities of the coasts by its thousands of kilometers. The questioning search into the identity of the Indians, manifested in their scorn for the German tourists who come, attired in their buckskin clothes, or the "authentic" artisanal goods that they sell during Indian days, or in real terms with the silver statues of buffaloes upon the great plains, shining in the light of the sun, or the realization of just what the skull that they found was and to whom it related... all of these are fascinating details, ones which seem to set up for the transformation of the story into something deep and profound. But for me, it is something that never arrived, and to write why seems so crass, ignorant, un-intellectual, excessively simple that I feel a constant guilt about it: that it is a book which ultimately leads to nowhere, which doesn't resolve itself, which exists in its little world with its tragedies and its crises and its problems, but ones which ultimately emerge unchanging save for the disappearance of one or two from the line of time: a coming of age story in a book, where nothing truly seems to come. Or perhaps there is something deeper, and it is just that my feeble mind cannot grasp it, that there is something more elegant and something more to examine than the life which does not change and the existence which does not alter. Perhaps there are others, who have a more advanced literary spirit than me, who will properly understand and appreciate this book. For me myself, it is one where the undoubted occasional jewels and diamonds in the rough alongside the path did not succeed in overcoming the basic feeling of futility in a book which was clearly not meant to be futile, the sense that nothing had changed, that nothing would change, that after all of the trials and tribulations what one had arrived at at the end was not really different in any way from the beginning, but without the necessary atmosphere, meaning, development, context, to write it as a true story of this meaninglessness and lack of motion. To me, it inscribes itself rather into a different mentality and belief about the world, one dramatically removed from my own, without the same interest in linear paths and conclusion, which as much as it might be at times burdensome to myself, is something from which I at least can but rarely escape. Even the conversations between the characters can sometimes inscribe themselves into this incomprehension on my part, as their words and sentences, their questions and queries, slide over each other like sheets of greased metal, never quite sticking, never quite touching, as if they talk past each other, in so many of the conversations between the characters, without the sense of definiteness and finality which marks the normal conversation and talks between people. In my own sense of confusion, I have turned to look at other reviews, to see what they had to say about this book, to see if it was just me who felt such incomprehension before it. Most seem to quite enjoy it, so perhaps I have myself painted myself into a corner. But the review which stuck with me the most was one which commented that if you are a non-native reader, you are bound to be confused, and that is a good thing - to be placed in a non-dominant position for once, as a confused outsider looking in, rather than the master on high gazing down in the omniscient power. For me, maybe I was simply too small to be able to grasp the beauty and the elegance contained in the work, confronted by the wall of its strangeness and of the road which ends without finding its terminus. Perhaps for you, it is a book which will inspire more confidence and interest than for myself, perhaps for you it is one which will not be quietly offsetting, quietly strange and bizarre in the way it paints a world and lays out its wheel of time and plot, and then leaves us to recoil as in the end, it does not turn. The Age of the Ship of the Line: The British and French Navies, 1650-1815 - Surely this has been done before?